The bonding process arises from an extremely complex neuro-chemical system within the more primitive parts of the brain. It is incorporated into the autonomic nervous system, and is linked to the endocrine system, which together, monitor and maintain physiological ‘balance’ (homeostasis), and it is an extension of it, in that it monitors and motivates psycho-social ‘balance’ (sociability). It is not necessary to know the full details, but the account below can make some sense of the remarkable process that makes us human. At birth, the baby’s physiology is fully functional to sustain life, but he needs nurturing and protection for a prolonged period. The main function of all the physiology is, ultimately to ensure that the tissue fluid throughout the body is maintained at its optimum consistency. This is monitored and controlled by specialised nerve centres and pathways and the interconnected endocrine system, and the process is called maintaining homeostasis. Because newborn human infants are, of necessity, still immature and dependent, the genetic DNA coding needed to be elaborated to drive humans to be altruistic and cooperative in the shared caring and support they needed. It is neuro-chemistry of the brain which gives rise to this elaboration which is termed ‘The Bonding Process’. It is very complex but a brief account is given below, which can suffice for adequate understanding of how the process influences all aspects of life, in health and sickness, and which provides understanding about Care which can be remedial.. The hypothalamus, the amygdala and the hippocampus. These nucleii have direct neural links from the thalamus, and have close interconnections with specialised areas that monitor all the sensory information that is relayed from the thalamus. This information determines the impulses that are passed to the sympathetic and parasympathetic autonomic nervous systems and to the pituitary gland and endocrine system, ensuring that internal homeostasis is maintained at all times. For most of the time this ‘fine-tuning’, with its many ‘feed back’ systems carries on, day and night, without conscious awareness. The Frontal Lobes & Right side of the Cortex. The function of the Auto NS is to maintain the level of physiological homeostasis and to respond to physical threats with alacrity. The sympathetic branch (Symp NS) mainly has adrenalin as the neuro-transmitter and, when physiological lacks or threats are detected’ it initiates the increase in heart and respiration rates, and re-distributes the blood in the body by controlling the diameter of arterioles. This, and the effects on other smooth muscle and glands, generate sensations that can reach conscious awareness when action of the whole body is needed, and these are experienced as hunger, thirst etc. or as anxiety when deficits or threats are serious. When fully aroused the ‘fight or flight’ response results. The parasympathetic branch (Para NS) mainly has acetylcholine and cortisol as its neuro-transmitters and its function is restorative in maintaining internal equilibrium and ensuring rest and repair. It also causes the release of endorphins in the brain which engender conscious awareness of pleasurable feelings. When babies are born this physiological monitoring system is fully functional, but because humans can only survive through communal living, an elaboration of this system of special nerve cells and pathways is laid down in the midbrain. These are inert until specific sensory information passes along them, within a specific ‘window’ of time, which is from birth and for twelve to twenty four months. It is the activation of these pathways and their linking with the physiological monitoring process that is called ‘Bonding’ and establishes ‘needs’ for approval and a sense of belonging from the community. However this system does not have an intrinsic feed back mechanism to meet the needs, and is entirely dependent on harmony with others. From the moment of birth the infant is bombarded with sensations and is programmed to recognise constant repetitions of the essential stimuli that arise from the nurturing behaviour of the mother, and then from others These elicit a whole range of behaviours, with socially acceptable ones being rewarded, and unacceptable ones being ignored or discouraged. 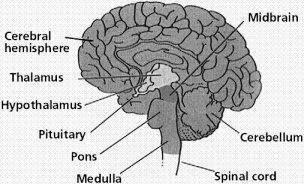 There is a close association between the Auto NS and the endocrine system by way of the pituitary gland. The endocrine system, through ‘feedback systems’ maintains the optimal function of the many chemical processes in the body. One of the effects of this process is the release of cortisol, which plays its part, along with adrenaline, in the bodies response to threats and lacks, and there are likely to be many others to be discovered.